Two very close collections Pietra Carrara and Venato Carrara but there is a difference in the Herringbone you can see the Pietra Carrara has more variation gray pieces. The Venato while still has gray veining, has less variation of the base color. On the mosaic it is really difficult to spot the difference. But in bigger tiles the variation would be more noticeable. On the outside Pietra is Black boxes and Venato is Brown with our Trade Marked exclusive Logo. Pietra Carrara, let’s start there. This is probably going to be a collection but we are not 100% sure in it’s direction at the moment as we engage on a voyage of discovery the consumer benefits by the price savings. The Pietra Carrara Mosaics have to be blended more it has more veining, more life more action and variety going on. What we do is ensure that the darker and lighter pieces of the mosaic are spread out creating a balanced look. You can see from the image. It is an incredible mosaic. The 2″ Hexagon in Pietra Carrara $9.75 a Sq.Ft. As long as we blend our end the look is incredible. As a mosaic this to me personally looks better than Venato I am attracted to the Variation and Price. Quick Mosaic Summary (for those that have to get on with the order). Mosaics look incredible. Had you removed the Venato from this image. The blending is excellent. Looks great and the price is unbelievable. Pietra Carrara base color has more variation (to Venato) within the Mosaics. Has more life and more activity for me I like it. I like the way it looks I like the price 🙂 but that is short term and a promotional price. It maybe that it is a collection that can only be made in mosaics. It is still in development and that takes years to build up to a million square feet, pick products, build molds and design. It is a good product for a bathroom floor. But if you need a full bathroom project, I would opt for Venato tiles and maybe save a little with Pietra Mosaics. The Venato collection has a white base but it is difficult to see over larger areas. Both offer a consistent base but in the field tiles the Venato is whiter slightly because the veining is softer. No one can have perfection but we are chasing it, and we may just catch excellence (always liked that quote). To get the best looks do as DIY Network and HGTV we have worked with both. For a 100SF job they order 130SF, they order 30% more and pick exactly what they want and throw away the rest. With marble over ordering is the key so you can dispose of any rouge tiles but Venato has a whiter look. You can see it in the room scenes a lot better than one piece. It was 2006 that I was the very first person (David Shearn typing now) that launched the first online collection of Carrara marble. You could buy three types of tile (3×6″, 6×6″ and 12×12″), one of 3 mosaics baseboard and a pencil (it was just 6 inches in size back then both base, board and pencil, the baseboard was around $27 a piece). We had 7 choices and it sold incredibly well. The prices were high as the economies of scale were not in place, machinery not yet perfected. The website looking back which I have screenshots (and do now and again) is embarrassing. Square tiles sold well in 2006 and then it all went “Subway Tile mad” so I decided to write about it with “It is no longer hip to be square the explosion of subway tiles in the USA” or something along those lines. By late 2008 we pushed further with collections keeping with Venato as our main line. Carrara Venato has now been sold for eight years and with its length of service granted a Trademark. I believe the only trademarked brand of marble. Jumping forwards we are at this point. The plan is to offer four lines. Carrara Venato. Pietra Carrara. Bianco Carrara “C” Grade and Bianco Carrara “CD” Grade. Four collections of marble. All with 80 to 100 SKUs each with each having one million square feet of inventory in the USA to support them. We have this in place already with Bianco and Venato. Businesses are difficult, they cannot standstill you either go forwards or backwards. My goal is: a commitment to the success of others. So forwards we must go. The world changes quickly so it is difficult to plan to far in advance. But sticking with the core principle of “do more with less and put the customer before profits”. Internally “Empower those within your team making their success your priority. Commit to the success of others and not yourself”. Is a solid company foundation. I wanted a company where people could work for life. Like companies of our Grandparents or Parents (trying not to get too nostalgic) but that is why our new fulfillment center is built where it is. We could have easily moved somewhere else, but this is designed to be surrounded by the best schools and they are all 10 out of 10 on zillow. I have yet to meet someone who enjoys a long commute, that is a huge negative. Long commutes impact corporate culture more than companies even understand. The current website is being changed and will launch with a new fresh look in January 2016 which we have hinted at. Following behind that is our new fulfillment centre on 5 acres supported by a main Distribution Center in Atlanta. Next year will be interesting. Carrara Venato Collection just goes together from format to format like a dream. White based, really white based. From format to format. Owned exclusively by thebuilderdepot.com and trademark protected. This incredible marble can only be purchased from our website. Considering that (and we own it exclusively) we made the prices fair, as fair as possible, trying to allow customers to add value back to their homes. For example; the Carrara Venato Honed 6×12″ is $8.00 a square foot, the Basketweave is $10.95SF and Free Shipping on the basketweave Honed (thru Feb 2016). The Arabesque can be bought by the square foot honed for $16.95 and also these items are in Polished as well. (we try and offer everything in honed and polished). Or if you are like me, by it in borders already cut and remove the black or gray section, or leave on. Depending on the look you are going for, Arabesque Border Black Marble Edge Honed and Polished for $13.95 each or with Italian Bardiglio edge for same price in Honed and Polished. An amazing collection endless combinations but a secret as we have actually yet to spend any money advertising it, we have just grown the old fashion way. Word of mouth. We have appeared in trade press, but that is because they asked and the same applies for our DIY spot on “I hate my Bath“. For us the reality, marble is a finite resource our quarry will like others run out or become more difficult to get to the places we need to. So advertising a product that you have absolutely no rush in selling in the big trade press makes no sense. They can cost over $350K. I was shocked. That would change a $10.95SF Basketweave to over $30SF which I suppose is where the others are. Instead we have gone for a no frills marketing strategy. We are not chasing numbers, we have no debt. We want to do the best possible job and then pass it on ensuring a hard-work ethic continues, “do more with less”. In fact our hurry to sell is so little that we do not even have a sales team. Just people to provide clarity and honesty, for example; one employee has a degree in forensic science with a major in law and another in Pastoral Theology. This is not a sales team and this is who we look for. Honesty. Present the facts let the consumer decide. Never sell. If our job is done right, the product will sell itself. Pietra Carrara 1×2″ Basketweave with Bardiglio Dot $8.95 a Square Foot. Pietra Carrara Basketweave with Gray dot $8.95 a Square Foot (Thru Jan 2016). Again the price is introductory through January 2016. For me if I was just buying a mosaic for a floor and wanted the Gray Bardiglio Dot I would probably go in this direction. The additional Gray in the white stone really makes the whole mosaic look really impressive. Again well underpriced, a new product Genuine Marble for $8.95 a Square Foot on a mesh backed mosaic 5SF to a box. Always order a sample and check before ordering that it fits with your plans. We will get more pictures as we proceed through 2016. I cannot believe 2016! It is 2017! More pictures of new Lots and still looking incredible. Carrara Pietra Gray Dot Basketweave $8.95 a Square Foot and Free Shipping for 2017. This lot is over a year later and the product still looks incredible. Very consistent. Again an iPhone picture taken straight out of the crate. You can see more of it on the picture below. It just has more life and more going on in the tile than Venato. It is lively. This is an introductory price for a new collection $9.45 a Square Foot for a genuine marble Pietra Carrara 2″ Hexagon Marble tile that is cheaper than ceramics, so there is not a lot in this for us, other than feedback and market knowledge. Which is valuable. Our learning can be your gain. We like to continually add to posts. This picture above was added in October 2016. Here is the Pietra Carrara 2″ Hexagon Honed installed for these very handy shower niches. Incredible job then used the 12″ pencil ($9.95 each) to frame them. Wow! What an install. June 24th 2017: Looking great. Two years since the first pictures taken and no change. A really consistent mosaic. Currently $9.45 a Square Foot and Free Shipping. Carrara Pietra 3″ Hexagon Mosaic as it arrives off the container. Incredibly consistent product. Matches from field tile to mosaic to trim with ease giving that perfect and popular White Gray look for $9.95 a Sheet without breaking the budget. Here is a picture in the pallet as usual, this I had to climb on top of other pallets. But I have to say the angle was more effective. So the difference over Venato is just more variation of Gray veining and pieces. $8.95 a Square Foot for a short time while we go through a new launch of this product. Carrara Pietra 1″ Hexagon $8.95 a Square Foot sold here. *Please note this price is subject to change it is a very low price and free shipping, I doubt this price can be held for a long period of time without some increase in exchange rates or shipping rates. The e-commerce website provides the real cost. This is a blog post and could be 10 years old over a period of time. The pricing was correct at the time the blog was posted. February 2017 Picture Straight out of the crate. Amazing over a year later and still looks the same. The consistency is remarkable. The price is still the same as well $8.95 a Square Foot for the 1″ Hexagon and Free Shipping. Only available in Honed. But part of a larger collection of products. Here. Carrara Venato Collection Basketweave $10.95SF and Free Shipping thru April 2016. This is the beauty of Venato. It is not as busy as the Carrara Bianco Collection but if you are going for a complex design of mixing sizes in the we have 6×12″ for $8.00 Sq.Ft. running into 8×16″ honed for $8.95 Sq.Ft. then you have an Arabesque Chair rail, pencil and $10.95 Sq.Ft. Free Shipping Basketweave (thru April 2016 -crazy right… 2016, where is my flying car). Then involve us and call. As this takes selecting lots to make sure it has a base match especially is you are going for Bianco, Venato is a breeze! The Beauty of this Trademarked exclusive Carrara Venato collection with around 100 different products of one stone collection is not just the price (which we keep low) as we control the supply chain making it 3-4 times more efficient and you will understand more how with the new website (we have some supply chain wizards on our team). But the way it all goes together with ease. The base color is the same. You can see it on the room scenes better. That for me has always been one of the key characteristics of the Venato Collection. Its consistency. We select it from a set range and it has to fit in that range to be cut and go into the collection (simple really). We have been on quite a good run through 2013 to 2015 where we have hit a sweet spot in the mountain and it has yielded great results. With 12 months plus of product in stock we know we are good for sometime yet to go. Let us hope it continues. Having said (or blogged all that). It is a finite product so it in time it will end, it will run out or fall out of the range the yield will change and that will result in any number of things to compensate, once upon a time Thassos marble was $10 a Square Foot. But is now running out. Incredible transformation. 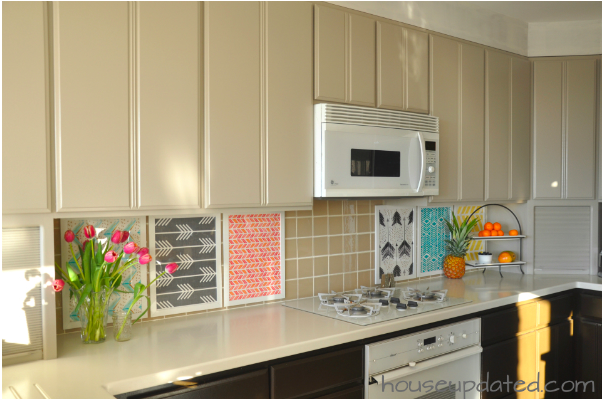 The backsplash is nice but the entire kitchen is spectacular, wow!